ver the years the origin of Blackjack, like many other games, has eluded researchers for a long time and which continues to be hotly debated to this day. Till date there has been no clear consensus, but most agree it probably originated in French casinos around 1700, where it was called Vingt-et-Un which, translated, means twenty-one. Most believe it was probably derived from the French card games, Chemin de Fer, and French Ferme, which were in vogue at that time. Another of its version was prevalent in Spain, which was called 'One and Thirty'. The basic rule of the Spanish version was to reach 31 with a minimum of three cards. A theory that’s also doing the rounds is that Blackjack was an invention by the Romans. It is believed that Romans used to play this game with wooden blocks of different numerical values. This theory holds some weight as Romans loved gambling, but that by no means confirms the theory. Among the various versions of the game, 'Vingt-et-Un’ or ‘21’ continued to grow in popularity and reach. It gradually spread to North America thanks to French colonists and soon after it was played throughout the continent. The rules of Blackjack were then different from those of modern or contemporary Blackjack. Just to elaborate, in this form of Blackjack, only the dealer was permitted to double. Also, a betting round was there between each of the playing cards dealt. The game was still termed ‘21’ when it gained popularity in Nevada in 1931 as the State first chose to make gambling legal. To draw more people to the game, some casinos then offered a special bet: A hand featuring either of the black jacks (the Jack of Spades or that of Clubs) plus the Ace of Spades would pay 10-to-1 odds on the lucky player’s bet. Although casinos later discontinued this peculiar payout, the name ‘blackjack’ or ‘black jack’ remained, as the game is known today. 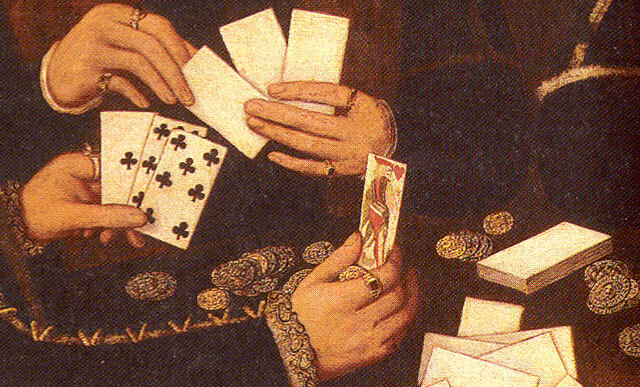 Five of Clubs: “Watson’s card”. The name has nothing to do with Sherlock Holmes but refers to a famous gambler who is supposed to have won £10,000 at Faro through his wager in connection with this card. Blackjack was not conceived by any one person at one definite point of time. On the contrary, blackjack has evolved over centuries; it continues to evolve and grow even today, thanks to the Internet. Fuelling its popularity the online casino industry has developed various versions of the game which has truly revolutionized it. Now a few reputed casino operators have started an innovative and far more enjoyable concept of this game: live blackjack game with real dealers. Live Blackjack is the most advanced way to play your favourite casino game right in the comfort of your home, without having to go a long way to a field-based casino.